Since September 11, 2001, U.S. Special Operations forces have grown in every conceivable way, from their numbers to their budget. Most telling, however, has been the exponential rise in special ops deployments globally. This presence — now, in nearly 70% of the world’s nations — provides new evidence of the size and scope of a secret war being waged from Latin America to the backlands of Afghanistan, from training missions with African allies to information operations launched in cyberspace. In the waning days of the Bush presidency, Special Operations forces were reportedly deployed in about 60 countries around the world. By 2010, that number had swelled to 75, according to Karen DeYoung and Greg Jaffe of the Washington Post. In 2011, Special Operations Command (SOCOM) spokesman Colonel Tim Nye told TomDispatch that the total would reach 120. Today, that figure has risen higher still. Formally established in 1987, Special Operations Command has grown steadily in the post-9/11 era. SOCOM is reportedly on track to reach 72,000 personnel in 2014, up from 33,000 in 2001. There’s a lot more in the full article. First, a digression right off the bat: let me say that I hope everyone who is interested in the precious metals is doing their own research on this topic so that they can make truly informed decisions, especially since I am not a registered financial advisor of any type, these are just my views of the world. One of the best ways I know to become informed on the metals is to get the free e-mails issued by GATA, the Gold AntiTrust Action Committee. You can sign up for their e-mails here. They send out links daily pointing to the best articles about gold and related topics from across the web. OK, end of digression. Since I was wrong last Spring about when gold would make its next move up, let’s look at the views of three very capable market commentators who were correctly bearish on the gold price during 2013, that is, they thought that the price would drop. They were right, and perhaps their analytical work will continue being right. So let’s look at what they are saying now, and throw in the opinion of the head of the largest gold refinery in Switzerland as well. The first analyst is Tom DeMark. Tom has been a trading advisor to the big institutions for decades. It’s rare for him to give his advice in advance to us commoners, though in his defense, he has published many of his techniques for those who wish to spend the time to learn them. We’re looking for a huge move in gold next year, beginning next year. We think the bottom will occur with the tax loss selling this year. So what he is saying is that, as soon as those who want to take trading losses on their gold positions for tax purposes (to balance off other gains they had) finish that activity, then price will begin that “huge move” up that his firm is expecting. His price projection, for a long time, for the downside in the gold price had been $1180. In the interview, he said they had revised that to somewhere between $1155 and $1180. The price went down to $1181.40 on the last day of 2013, the last possible day for tax loss selling for the 2013 tax year. That’s probably plenty good for meeting his price target, but we’d have to be institutional clients of DeMark to know whether he now thinks price might still move down to $1155. In any case, by DeMark’s famous work, the price low is already behind us or will be here very soon. There will be evidence below that JP Morgan may have been following DeMark’s advice precisely. 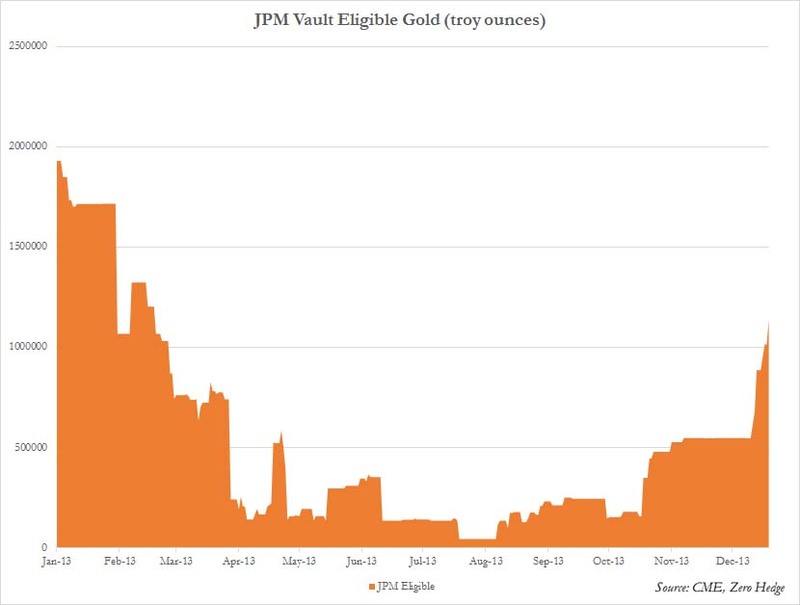 While all of the Western media is filled with anti-gold stories, China continues to buy virtually all of the available physical gold at these levels, and will continue to do so on any further price declines. Also, the flow of gold into India has continued because of increased smuggling. But none of the smuggled gold is being reported in the official import numbers. As you know, Eric, I have extremely good sources and contacts in India because we’ve done business there for years. If our sources are correct, this year the gold imports into India are very close to 1,200 tons, which is a staggering figure. Regardless, 2014 is going to be an extremely good year for the precious metals. I believe we could easily see new highs in nominal terms in both gold and silver. We may see $2,000 to $2,500 in gold, and $50 to $60 in silver, maybe even higher. The bottom line is that 2014 will be the year that the cartel gets broken. To say that this was good advice, at least so far, would be quite an understatement. 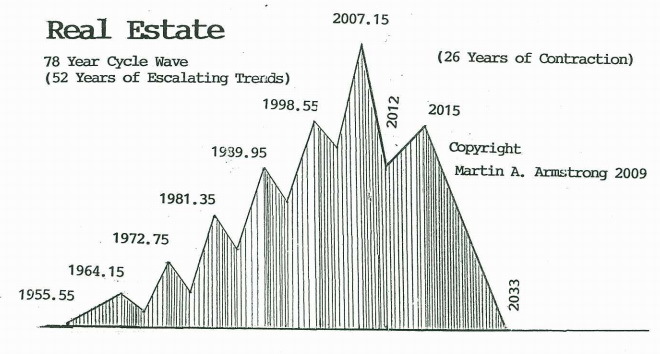 Also in the 1990’s, he told his clients that interest rates/mortgage rates would fall till January 2013 and then start an inexorable rise for many years to come. He was only off by six months, interest rates went to their lowest level in mid-2012 and have been generally rising since. So the guy is very smart. But I don’t have a link to his site on the Thundering Heard home page because it is nearly unbearable to read him daily. Anyone else’s views on anything, he calls those opinions, and pelts them with ridicule and insults if they disagree with his own opinions, which he claims are not opinions, but actual facts. His cycles work is fabulous, his knowledge of history is formidable, but when he strays from those, as he often does, you have to put your boots on and wade through it. That’s a worthwhile exercise, but you have been warned. Anyway, Armstrong is our third analyst who was bearish on gold all year, to the point where he called anyone advising buying gold during 2013 to be a fool, criminal, and worse. But all year, he has expected a Directional Change (his capitalization) for gold in this month of January, 2014. So with DeMark, Kaye, and Armstrong, you have three very capable analysts who think this price downmove is over, or will be in over in this month of January. If I were a person with savings denominated in fiat currency, I would be jumping all over this opportunity. But of course, people need to make their own decisions. As mentioned above, getting the free e-mails from GATA is a great place to start. And no, they don’t sell your e-mail address to others. So what does the head of the largest Swiss gold refinery have to say about all this? We met with the managing director of the largest refinery in Switzerland and spend about two hours talking to him…Now, this gentleman we were talking to probably has a better idea of physical gold flow than anybody else globally. He sees what is coming from the mines, he sees what is coming from the UK, and all over the world, as well as where its going. He indicated the price didn’t make sense because he has got so much fabrication demand. They put on three shifts, they’re working 24 hours a day, and originally he thought that would wind down at some point. Well, they’ve been doing it all year. Every time he thinks its going to slow down, he gets more orders, more orders, more orders. They have expanded the plant to where it almost doubles their capacity. 70% of their kilobar fabrication is going to China, at apace of 10 tons a week. That’s from one refinery, now remember there are 4 of these big ones [refineries] in Switzerland. …At this Swiss refinery there have been several times this year on which they were unable to source gold, this shocked me. They’re bringing in good delivery bars, scrap and dore from the mines, basically all they can get their hands on. This gentleman has been in the business for 37 years, he was there during the last bull market in the late seventies. I asked him when was the last time this has happened, that he was unable to source gold, he said never. And I clarified it, I asked: let me make sure if I understand what you’re saying to me, in the last 37 years you’ve worked in the gold industry this has never happened? He said: this has never happened. When do think the price is going to rise? What Stanczyk is talking about is shown on the next chart, which has only been updated through the end of October. 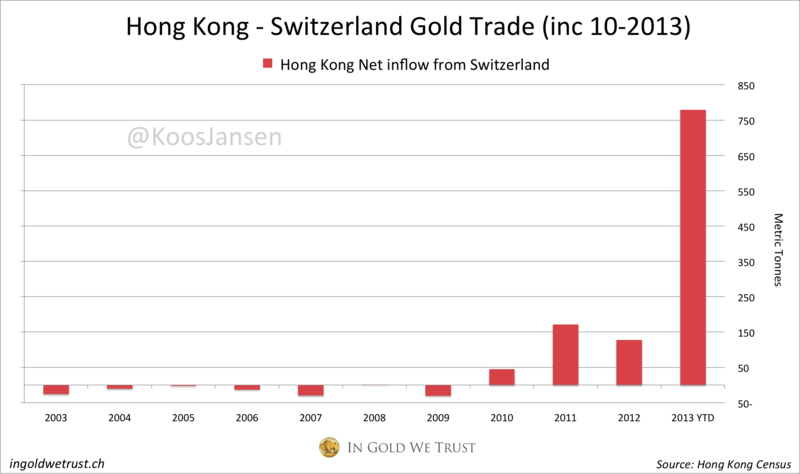 Hong Kong has imported more gold from Switzerland in 2013 than in all prior years combined! And here is a chart of total Chinese imports from Hong Kong by month since Autumn 2011. And this chart doesn’t show imports from other sources or China’s own mine production, which is now the largest of all countries and which is keeping six large refineries busy in China. 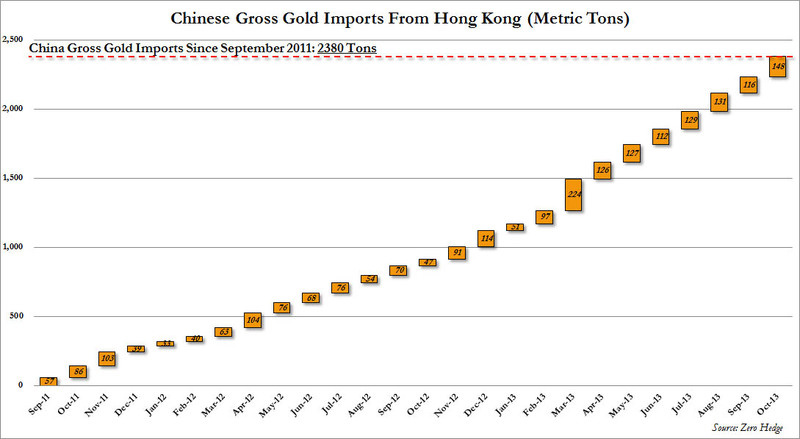 There have been reports (blatant lies is what they are) in the Western media that Chinese gold imports have been falling. Does this look like falling to you? Each of those numbers are tons. Sales of Gold Maple Leaf coins by the Royal Canadian Mint surged 82.5% to 876,000 ounces in the first three quarters of 2013 from the same period of 2012. The Perth Mint, Australia’s national coin and bar producer, saw sales rise 41% to 754,635 ounces last year, while the U.S. Mint sold 14% more American Eagle gold coins than it did in 2012, along with a record amount of silver coin. In Part 2, we’ll talk about how it is possible to have extraordinary worldwide demand for physical gold and still have a falling price.